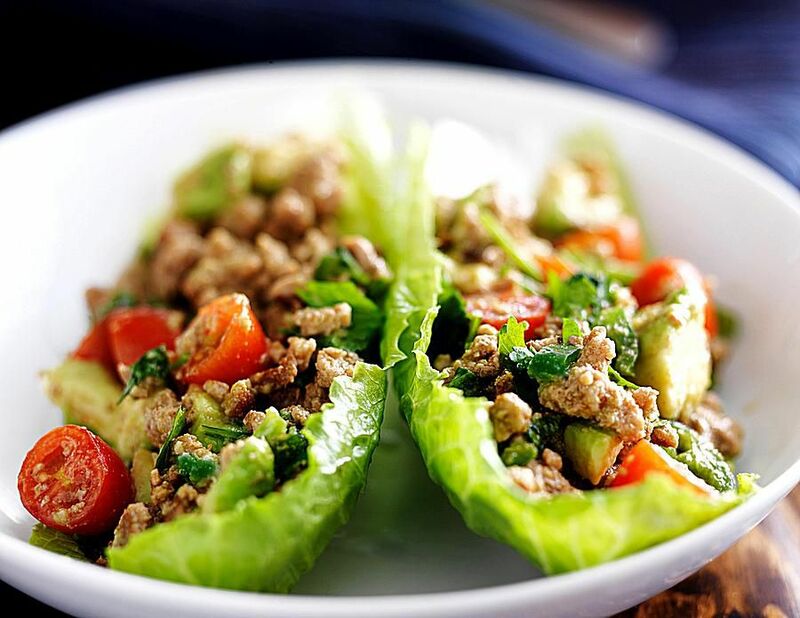 If you like lettuce wraps, try this wonderful Thai Basil Chicken Lettuce Wraps Recipe! Based on the traditional Thai dish, Basil Chicken, this dish is brimming with taste and is fun to eat. Have all your ingredients chopped and ready to go, then the cooking is literally only a few minutes. Set the hot filling and cool lettuce leaves out on the table, then have your friends and family wrap their own. Makes a crunchy-delicious dinner that is very satisfying, or serve it as a special appetizer for a dinner party. ENJOY! Place all stir-fry sauce ingredients together in a cup. Stir well to dissolve the sugar. Cut out the core of the lettuce(s) to make separating the leaves easier. Gently separate and place leaves on a plate in the refrigerator until ready to eat. Drizzle a little oil into a wok or large frying pan set over medium-high heat. Add the shallot/onion and garlic. Stir-fry until fragrant (30 seconds). Add the chicken and stir-fry 2-3 minutes, or until nearly cooked. When wok/pan becomes dry, add enough chicken stock to create a good sizzle (2-3 Tbsp. at a time). Add the mushrooms and chili. Continue stir-frying another 1-2 minutes, or until chicken is cooked. Now add the green pepper, tomatoes, stir-fry sauce, plus any remaining chicken stock. Stir-fry another 1-2 minutes. Add the bean sprouts and gently fold them in for 30 seconds to 1 minute (you want to retain their crispness). Reduce heat to medium-low and push ingredients to the side of the wok to reveal the sauce. Add the cornstach mixture, stirring until sauce has thickened. Remove stir-fry from heat and fold in the chopped basil leaves (see basil tip below recipe). Taste-test, adding more lime juice if too salty. If not salty or flavorful enough, add more fish sauce. Place this stir-fry on the table together with the lettuce leaves on the side, and let everyone put together their own wraps. Note that lettuce wraps can be a tad messy, but that's half the fun. ENJOY! Optional Toppings: Although these lettuce wraps are delicious as is, you can also serve any of the following toppings in bowls on the side. Our favorite: chopped cashews or peanuts. Others: fresh basil, fresh coriander, sliced green onion, chili pepper, or crispy noodles. If you'd like to serve these wraps with a side sauce, try either hoisin sauce or Thai sweet chili sauce. *Basil Cutting Tip: To get the most flavor out of your basil leaves: keep them refrigerated until ready to add. Then stack the leaves together (one on top of the other, as many as you can) and roll the stack up (from tip to stem or sidelong). Now thinly slice the roll to create thin shreads of basil. Add these shreds to your dish for the most flavorful results!